An arepa is a bread made of corn originating from the northern Andes in South America, and which has now spread to other areas in Latin America (e.g. Costa Rica, where it is now popular). It is similar to the Mesoamerican tortilla and even more to the Salvadoran pupusa. Left: Arepas cooked with firewood (Venezuela). Arepa is a native bread made of ground corn, water, and salt which is fried into a pancake-like bread. It is either topped or filled with meat, eggs, tomatoes, salad, cheese, shrimp, or fish. The characteristics of the arepa vary from region to region. It may vary by color, flavor, size, thickness, garniture, and also the food it may be stuffed with. The word "arepa" may originate from the language of the Santander natives (East of Colombia) that means "maize." There are two ways to prepare the dough. The traditional, labor-intensive method requires the maize grains to be soaked, then peeled and ground in a large mortar known as a pilón. The pounding removes the pericarp and the seed germ, as only the cotyledons of the maize seed are used to make the dough. The resulting mixture, known as mortared maize, or maíz pilado, was normally sold as dry grain to be boiled and ground into dough. The most popular method today is to buy pre-cooked arepa cornmeal. The flour is mixed with water and salt, and occasionally oil, butter, eggs, and/or milk. After being kneaded and formed into patties, the dough is fried, grilled, or baked. This production of corn is unusual for not using the nixtamalization, or alkali cooking process, to remove the pericarp of the corn kernels. Pre-made arepa flour is usually made from white corn, but there are yellow corn varieties available. Both Colombians and Venezuelans view the arepa as a traditional national food. The arepa has a long tradition in both countries, with local recipes that are delicious and varied. In Eastern Venezuela, the most common variety of arepa is usually about 3 to 8 inches (200 mm) in diameter and 3/4 inches thick. Larger arepas can be found, made with either white or yellow corn. In the western Andes, arepas are flatter, and are typically quarter of an inch or less in thickness and 3 to 4 inches (100 mm) in diameter. An arepa can be eaten with a filling or with a topping. In Venezuela, various kitchen appliance companies sell appliances similar to a waffle iron, which cook arepas using two hot metallic surfaces clamped with the raw dough inside. 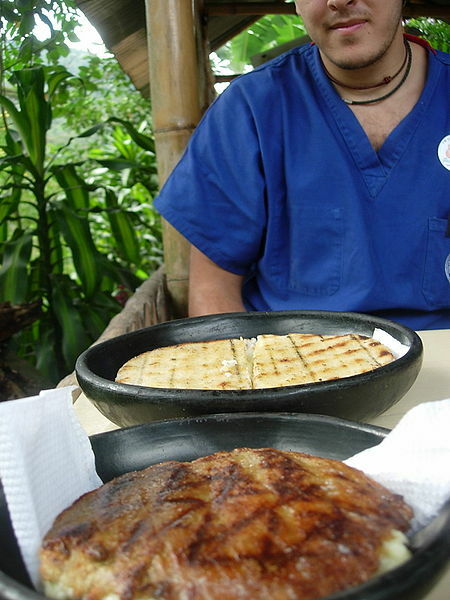 In Venezuela, the arepa is traditionally grilled on a budare, which is a flat, originally non-metallic surface which may or may not have a handle. Arepas cooked this way are called tostadas. 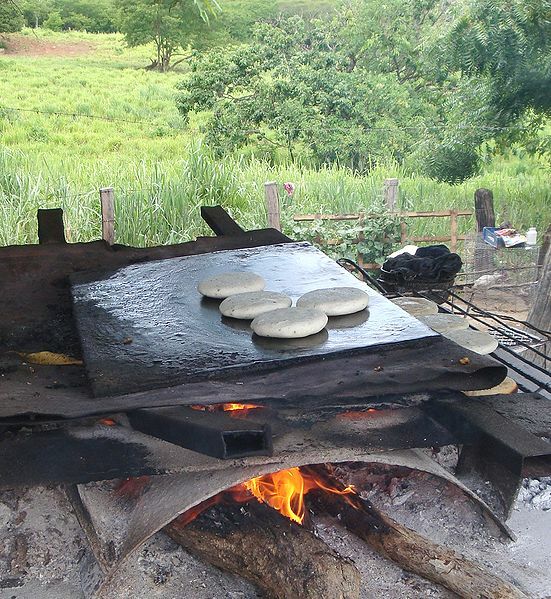 In Colombia, the arepa has deep roots in the colonial farms and the cuisine of the indigenous people. Today, arepas are prepared less frequently at home and are usually purchased in stores, either pre-made or in flour form. Arepas are usually eaten for breakfast or as an afternoon snack. Common toppings include butter, cheese, and hogao (also known as criollo sauce). Egg arepa (arepa de huevo) is popular in most major cities. This arepa is deep-fried with a single raw egg inside that is cooked by the frying process. Egg arepas are made with yellow corn dough and fried in the same manner as Colombian empanadas, and are often sold alongside other traditional Colombian foodstuffs at food stands. One variety of egg arepa has shredded beef added as well. 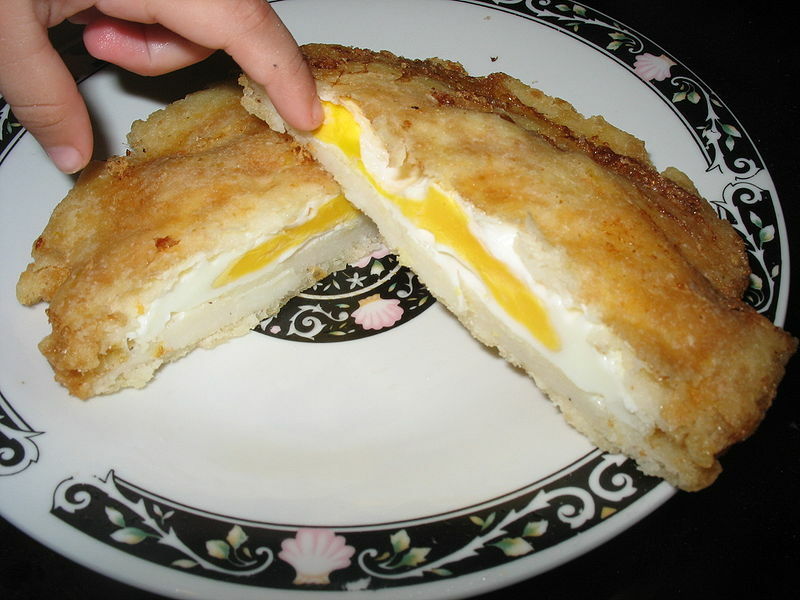 Left: Inside of an arepa with egg.